Gatwick Diamond Business is the region’s leading independent voice for business; providing commercially useful networking opportunities. The Preview Group is proud to have been associated with GDB for many years, so we were delighted when they approached us to wrap their shiny new company vehicle. 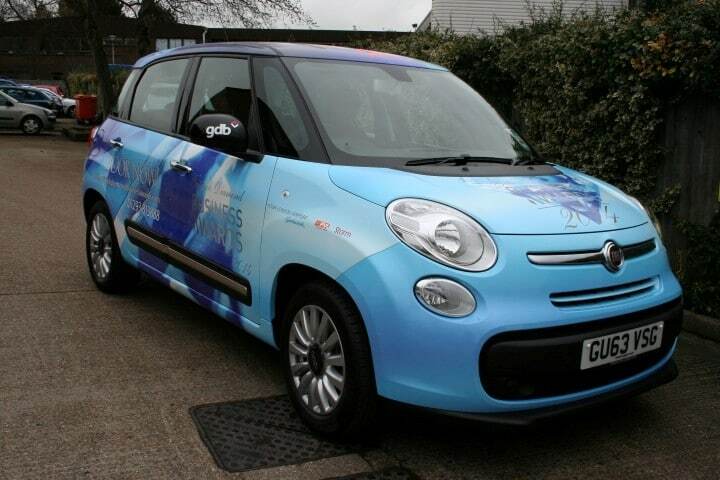 Jeremy contacted us to wrap the new Fiat 500L with a brief to promote the Gatwick Diamond Business Awards 2014 with something more eye-catching than red paint! We worked with Storm Creative to develop a design that delivers the iconic GDB award brand, featuring a large diamond image with the face of the host Tim Vine cheekily popping out the rear window. Headline sponsors, Gatwick Airport, have a prominent position on the roof area. The design was printed onto high quality wrapping vinyl and a UV safe over-laminate applied to protect the print before our expert application team applied the design to the entire vehicle in a few days. Finally, the text sections were cut from printed reflective material to give the design a real stand out appearance in the dark! The wrap protects the paintwork and would last in excess of 5 years, but is completely removable and after the awards ceremony in March we will be replacing this design with new one to promote the GDB business association.